Polar has launched a new training computer aimed at runners, cyclists and fitness enthusiasts. The RCX3 GPS has a large, user configurable screen and a specially designed ventilated wristband. It comes in two designs to fit both men and women. The G5 GPS sensor is very small and weighs just 18g, yet Polar says it has 20 hours battery life. It comes with an armband or it can sit in a pocket, and charging is via mini USB. The RCX3 GPS measures speed and pacing, calorie burn, and has a new ‘training benefit’ feature that gives instant feedback based on each session. 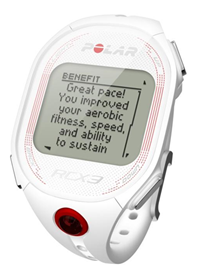 The RCX3 GPS also includes Polar’s Smart Coaching features to help you control training sessions better and avoid using guesswork, and it can be used in conjunction with Polar’s online service, www.polarpersonaltrainer.com. Its buttons are placed, says Polar, in ‘natural’ positions – we suppose this means they should be easy to get at when you are concentrating on training. We’ll be testing that in due course when we get a sample to review. The RCX3 GPS is available imminently with an RRP of £259.50 inc VAT.